Below are roping saddles for sale on eBay, both new and used, and in all price ranges. For information on roping saddle riggings, please scroll down beneath the saddles for sale. Thanks to the needs of the working cowboy, riggings on most roping saddles today are either "full-rigged," "7/8 rigged," or (less commonly) "3/4 rigged." 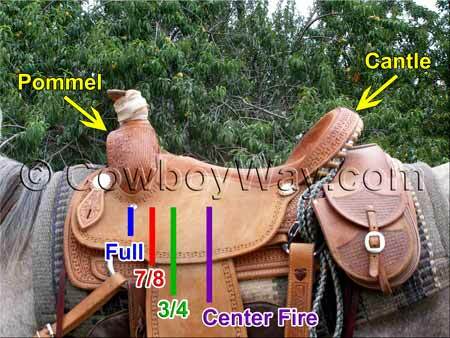 This means that the front cinch is farther forward toward the front of the saddle than an older style of rigging called "center fire." Full-rigged and 7/8 rigged roping saddles, when used with a back cinch (sometimes also called a "flank cinch"), are designed to handle the force and stress of roping, both on the saddle and on the horse. Below: An illustrated photo showing approximate saddle rigging positions. 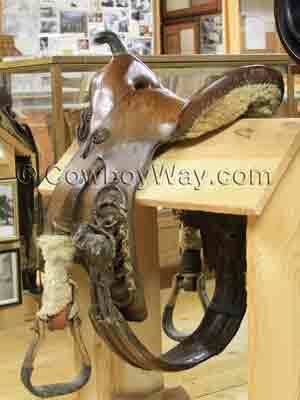 Below is a photo of a center fire rigged saddle on display at the Don King Museum, a wonderful museum inside of King’s Saddlery in Sheridan, Wyoming. As you can see, it has a center fire rigging. Roping saddles are typically full-rigged or 7/8 rigged. Below: A saddle with a center fire rigging. When shopping for a roping saddle it can sometimes be helpful to understand that saddle rigging positions vary from one saddle maker to another. In other words, one saddle maker's full rigging position (or any of the other positions) might not be in the exact same place as another saddle maker's. Since there isn't an industry wide standard for rigging positions, and each saddle maker sets their own standards.